"Oshizu Reiza" was premiered in the 2nd lunar month of 1867 at the Ichimuraza, within the new year sogamono "Keisei Soga Kuruwa Kagami" [more details]. The roles of Oshizu, Reiza and Okushûya Yasuemon  were played by Sawamura Tanosuke III, Ichimura Kakitsu IV and Seki Sanjûrô III. It was revived in ôshibai in January 1884 at the Ichimuraza, where it was staged under the title "Norizome Soga Ogyô no Matsu". It starred Kataoka Gadô III, Iwai Matsunosuke IV and Nakamura Shikan IV in the roles of Reiza, Oshizu and Okushûya Sôzaemon . The title "Fubuki no Hana Oshizu Reiza" was used for the first time in ôshibai in March 1917 at the Kabukiza. It starred Ichimura Uzaemon XV, Nakamura Utaemon V and Ichikawa Danshirô II in the roles of Reiza, Oshizu and Okushûya Sôemon . The last act was staged as an independent drama entitled "Koiso-ga-Hara Yuki no Shigarami" in February 1950 at the Mitsukoshi Gekijô with Nakamura Kanzaburô XVII, Nakamura Shikan VI and Ichikawa Danzô VIII in the roles of Reiza, Oshizu and Okushûya Sôemon . The current structure of "Oshizu Reiza" is made up of 3 acts. The last act is occasionally staged as an independent drama which is entitled "Koiso-ga-Hara Yuki no Shigarami". The opening scene takes place in Edo in the district of Negishi. Oshizu is an onna tayû, a street musician who sings ballads from door to door and begs alms. She is such a beauty that she is known in her neighbourhood by the nicknames of Ima Komachi  or Komachi Oshizu, which can be translated as the Komachi of today. Komachi was the name of a famous court beauty and poetess during the Heian period. This beautiful street musician and the Okushûya tedai Reizaburô have fallen in love with each other. The Okushûya is a dôguya and Reizaburô is commonly called Reiza. He is a handsome young man who has been nicknamed Ima Narihira  or Narihira Reizaburô, Narihira being the name of a handsome Heian period court poet. Oshizu has given birth to Reiza's child, who is now a seven year old boy known by the name of Chiyomatsu, living with his mother and his grandfather Hokke no Denji in a poor neighbourhood full of beggars, entertainers and others hinin. They can't marry as they belong to two different social classes . One day, during a sudden shower, Osute, a beggar woman living in the neighbourhood, is seen scurrying around seeking Chiyomatsu in order to make him home out of the rain. She is joined by a beggar Ichisuke, who takes Chiyomatsu home on his back. In the meantime, a group of people are taking shelter from the sudden shower under the giant pine of Negishi beside a wayside shrine. On the veranda of the shrine, Reiza is seated next to Oshizu. Under the tree, the Okushûya nyôbô Otami and her daughter, the Okushûya musume Ohaya, are also taking shelter together with other members of their party. Also taking shelter under the tree at the same time are the scoundrel Ushijma Chikara and the doctor Tsurugizawa Bakuan, who are partners in petty crime. Presently, the presence of Reiza at the site is noted, and Ohaya, who is infatuated with the handsome tedai, is overjoyed at the chance of a meeting. When the shower subsides somewhat, Ohaya and her mother, with the rest of their group, invite Reiza to accompany them, but Reiza says that he is on an errand, to take a precious sword to its owner. He will join the party after his errand is finished. Bakuan, hearing about the valuable sword, secretly motions to Chikara and signals him that they should steal the sword. The two men leave the place. Otami, Ohaya and their group also take their departure. Oshizu and Reiza are talking together when Bakuan and Chikara stealthily return and steal without being spotted the box containing the sword. A few minutes later, Reiza suddenly realizes that he has lost the precious sword. Oshizu finds a crumpled bit of paper on the ground, which turns out to be a message written to the doctor Bakuan. They therefore are sure that Bakuan and Ushijma Chikara have stolen the sword. Having overheard the two rascals' previous conversation in which they had said they were going to a certain restaurant, Reiza sets out in that direction, hoping to quickly recover the lost sword. Reiza, having been unable to locate and retrieve the lost sword, is in despair. He comes by a bridge over the Ô River with the intention of committing suicide by throwing himself off the bridge. Hokke no Denji, Oshizu's father, who happens to be on the bridge, stops the would-be suicide. They recognize each other in surprise. Denji, in spite of Reiza's protests, makes Reiza calm down and explain the circumstances. Several groups of people live together in the hinin shack, including some actors of a nearby playhouse, as well as the beggar woman Osute, and Denji's family, composed of Denji and his two daughters, Oshizu and Okô , and the boy Chiyomatsu. Since being saved from suicide by Denji, Reiza is living here also. Reiza is perturbed about the lost sword. This sword had belonged to a family in whose service Reiza's elder brother Yosobê had been, before the sword had been lost and Yosobê discharged from service as having been partially responsible for its loss. It had been recovered through the cooperation of the Ôshûya shop where Reiza had been clerk, the store being one that handled antiques and other used articles. It was for this reason that Reiza had been entrusted with the errand of taking the sword to its rightful owner, upon which Yosobê was to be reinstated in his former post in the owner's service. As Reiza and Oshizu are talking together, Chiyomatsu returns, saying he had been given a gift of candy by a woman. The woman turns out to be Otami, the Okushûya nyôbô, accompanied by Reiza's brother Yosobê. When the visitors step into the house, Reiza, recognizing them, tries to flee, but he is stopped by Otami. Oshizu, when she learns the identity of the visitors, is understandably perturbed. Otami explains that she has come to ask Reiza and Oshizu to part from each other. She explains that her daughter Ohaya has fallen in love with Reiza, and steps have already been taken to organize their wedding. Yosobê's consent to Reiza's marriage had been gained and the act of retrieving and returning the sword to Yosobê's former master was also a part of the betrothal arrangement. It was only afterwards that they have become aware of Reiza's love affair with Oshizu and of the existence of Chiyomatsu. Both Oshizu and Reiza refuse to be separated. Okô, Oshizu's sister, comes out from the inner room, having overheard everything. She is quite angered at Yosobê's discriminating attitude toward her family. She says that there may be class distinctions, but that so far as humanity goes, they suffer no lack in spite of their lowly status. Denji also adds his words, saying that he is against separating the lovers. Otami says that she would not insist on Reiza's leaving Oshizu to wed Ohaya were it not for the fact that Ohaya is not her own daughter by birth but a step-daughter, having been born to her husband's first wife. Therefore, she feels obligated to fulfill Ohaya's desire, much more than if Ohaya had been her own daughter. Denji replies that in a similar way, he is obligated to see to Oshizu's happiness. Oshizu is not his own daughter, but an abandoned baby that he has picked up after praying at a shrine for a child. Soon afterwards, their own child Okô was born, and he has brought up both girls as his own daughters. If Oshizu were his own child, he would ask her to sacrifice herself for the sake of Reiza's future. On hearing this tale, Otami and Yosobê feel that no amount of argument will avail, and start to take their leave. However, Oshizu stops them. She says that she has determined to part from Reiza. Reiza protests, but Oshizu insists. Otami tactfully leaves with Yosobê, telling Reiza they will wait for him at a designated place later, thereby allowing him a chance for a farewell with Oshizu and Chiyomatsu. About a month has passed since Oshizu and Reiza's parting. In the meantime, Oshizu has cried so much that she has lost her sight, while her father Denji too, has fallen ill. Oshizu has started a daily pilgrimage to a shrine to pray for recovery of her sight in front of a giant jizô stone statue. 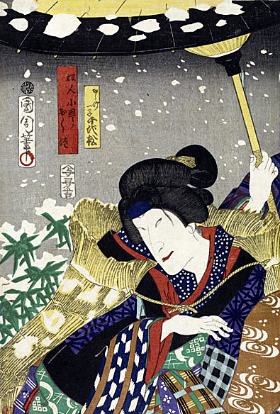 On this day too, she is seen on her way to the distant shrine, pushing through the snow-covered field in Koiso-ga-Hara. She is led by her son Chiyomatsu. A passersby along the path takes pity and offer her a paper umbrella to protect her and the boy from the falling snow. Later, another passerby, seeing that Oshizu is terribly sick, stops to offer his coat and a few coins. 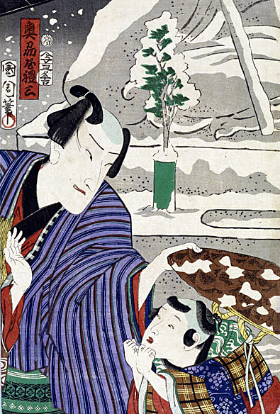 Chiyomatsu gives the medicine to his mother, who is still suffering from pain. It is at this point that Reiza happens to pass by with his father-in-law Okushûya Sôemon, the father of Ohaya. Chiyomatsu recognizes Reiza and calls him. Reiza is afraid that Sôemon becomes aware of Oshizu and Chiyomatsu's identity. However, Sôemon is quite hard of hearing, and does not realize anything. However, he notes that the woman seems to be in pain. When the boy Chiyomatsu runs to Reiza and clings to him, Sôemon asks if the boy is begging for alms. He asks Reiza to find out from the mother and child what the circumstances are that have brought them to such a state. This gives Reiza an opportunity to speak with Oshizu and she tells him about her blindness. In the meantime Sôemon takes a good look at the boy and notices his physical resemblance with Reiza. It is obvious for the old man that this woman in pain is none other than Oshizu, Reiza's former lover and the mother of Reiza's child. He feels pity for them. Acting as if he remembers a sudden errand, he informs Reiza that he will go to the home of an acquaintance who lives nearby. Reiza feels he should accompany Sôemon, but Sôemon tells him that it is only a short distance walk to the house where he has business, and that he will soon be back. He tells Reiza to care of the sick woman in the meantime. With these words, he tactfully leaves the couple and the child. Reiza helps Oshizu, asking Chiyomatsu to get some water from the nearby stream. Unfortunately Chiyomatsu falls into the cold water. He is quickly rescued by Reiza. After Oshizu recovers somewhat, she tells her former lover that in the future he is not to speak to her even though he should pass her on the streets, as it is best for all concerned that they have no further relationship with each other. Presently Sôemon returns. He has brought with him a rare medicine which should cure Oshizu's blindness. She drinks the medicine as instructed by Sôemon. Then Sôemon departs, with Reiza accompanying him. A few minutes later, Oshizu miraculously regains her sight. From the distance, she watches Reiza and Sôemon as they fade away in the flurry of snow. "Oshizu Reiza" was quite regularly staged in koshibai. In Tôkyô only, it was staged around 40 times on koshibai stages during the Meiji and Taishô eras ... and only 4 times in ôshibai! The title "A Flower in a Snowstorm: Oshizu and Reiza" came from Jim Reichert's "In the Company of Men: Representations of Male-Male Sexuality in Meiji Literature". First Yasuemon, then Sôzaemon and finally Sôemon. It took a few productions to definitively fixed the name of the Okushûya master. Ima means now in Japanese. In Medieval Japan, interclass marriages were strictly forbidden. Originally, the sister of Oshizu was named Oyuki, not Okô.